Mango Float Recipe is easy to make and very delicious Filipino dessert, as a result it is always a big hit during Christmas and New Year celebration. Mango float are my family’s favorite dessert and the ingredients are not expensive. Did you know that Mango has many Health Benefits? 76% vitamin C which helps as antioxidant and boosts immunity. 25% vitamin A, an antioxidant and improves your vision. Mango helps in digestion. Mango contains enzymes that help in breaking down protein. The fibrous nature of mango is rich in vitamins. With it’s high in pre-biotic dietary fiber and minerals that will help in digestion. Mangoes boost your immune system with the combination of vitamin C, A and 25 different types of carotenoids, this helps keep your immune system healthy. To know more about the Health Benefits of Mango fruit check out Top 10 Health Benefits of Mango. Mango Float Recipe dessert is the Filipino version of the popular icebox cake dessert made with layers of graham crackers but others use ladyfingers (broas), whipped cream, condensed milk, and ripe carabao mangoes. Where can you buy the best Mangoes in the Philippines? According to Wikipedia, there are 14 different strains of Carabao mango. These strains include the Talaban and Fresco of Guimaras, MMSU Gold of the Ilocos Region and Lamao and Sweet Elena of Zambales. Mango Float Recipe dessert can be made with two layers of filling or three, depending on the size of your baking pan or dish. In this preparation we used a smaller glass baking dish so we can make 3 layers, because with the glass, you can see the pretty layers. Try this Pinoy Recipe at iba pa version of Mango Float Recipe this Holiday season or in whatever gatherings you have with your family and friends. You will surely enjoy this Filipino dessert, because of the right amount of sweetness, layers of whip cream, graham crackers and mangoes. You can also combine Mango with other fruit like Peach, you can view our version of Peach Mango Float Recipe here. Mango Float is very a delicious Filipino dessert, a big hit during Christmas and New Year celebration. Mango float are my family's favorite dessert and the ingredients are not expensive. Prepare an 8×8 baking dish glass or any similar container and set aside. Wash mangoes, cut both sides off the pit, peel and slice the flesh thinly. Don’t throw the pit, scrape the flesh and reserve. In a mixing bowl, whip the cream until light and double in size. Add in chilled all-purpose cream, condensed milk, vanilla extract and a pinch of salt and mix until well combine. At this point you can taste test your cream and adjust the sweetness according to your taste. To assemble the mango float, first you have to arrange graham crackers in your baking dish. Lay the crackers flat and even until you cover the whole bottom of the pan. Use scissors or sharp knife to trim the crackers, if needed. 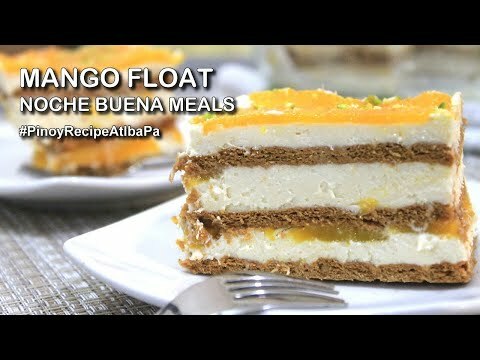 Enjoy this easy to make Mango Float Recipe with your family and friends this Christmas season or on any occasion. where can I buy Frosty whip? Thank for sharing your recipe. I’ve tried a few recipe from online but this recipe is the Best. Can’t get hold of sweet fresh mangoes here but tried it with canned peach fruit and still love it. Oooo! Mango! I know I’d love this. Thanks! Mango cakes are one of my favorites. Hmmm this one looks delecious I gonna make my own dessert base on this dessert Larry Mango Choco Float. Yum, this looks delicious, I have never heard of this but I’d love to try it. Thank you for sharing this recipe. That is one good looking dessert! I love mangoes. I had no idea Filipino desserts recipes were that good! Ive never tried any mango deserts. I think my family would enjoy it! This is a great recipe for summer! Like the layering and use of graham crackers. Thanks. Thanks for sharing this recipe i wanna make this one for my kids! This looks so delicious, I’ve got to try it! Thank you! I don’t see many dessert recipes with mango, but this absolutely looks delicious and I will be trying it this summer! Sana magawa ko to para sa family ko balang araw. This sounds amazing. I will be trying this for my family! Anyone who likes mangoes will love this easy-to-prepare recipe. Thanks! This recipe is perfect for summer!! It is so light and fresh!love it! masaya ako kase madami akong natutunan na mga lulutuin, salamat sa inyo….